MANCHESTER, England -- A fake bomb left behind during a security exercise led police to evacuate Manchester United's home stadium on Sunday, disrupting the final day of the English Premier League season and bringing embarrassment to one of the world's best-known sports teams. Police initially described the device as "incredibly lifelike" as United's planned match with Bournemouth was cancelled, to boos from some fans, and a controlled explosion was carried out. But hours later, bomb technicians reported it was a fake. And a later statement by police said the device had been inadvertently left in a toilet during an earlier training exercise involving sniffer dogs. The series of events Sunday came amid tightened security at Premier League stadiums following last year's Paris attacks that targeted the Stade de France sports stadium as well as cafes, bars and a concert hall. It also followed the British government's announcement Wednesday that it was raising the nation's threat level due to intelligence indicating the "strong possibility" of attacks in Britain by factions of the outlawed Irish Republican Army. The Premier League has rescheduled the match for Tuesday. United said it was investigating the incident. "It is outrageous this situation arose and a full inquiry is required to urgently find out how this happened, why it happened and who will be held accountable," said Tony Lloyd, Greater Manchester's mayor as well as the district's police and crime commissioner. Sunday's match was the first Premier League game to be postponed because of a bomb threat. An exhibition soccer game between Germany and the Netherlands was canceled in November after police said they received a bomb threat. No explosives were found. 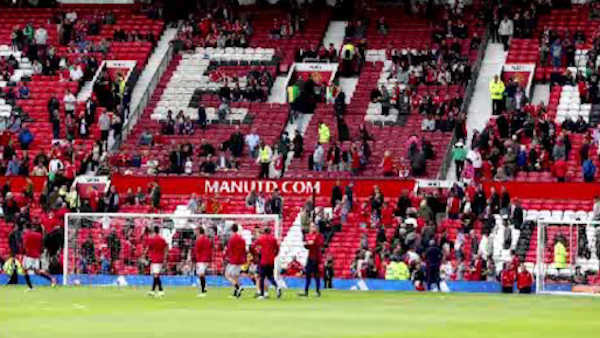 Sunday's scare was set off after Manchester United staff found a suspicious device in a toilet in the northwest corner of one of the stands, police said. Fans sitting in other stands initially were allowed to stay inside the stadium, but about a half hour before the scheduled 3 p.m. (1400 GMT) kickoff, they were escorted out by security personnel, and a sweep of the 75,635-seat venue was carried out. Players from both teams were taken off the pitch during the warm-up and kept in the changing rooms. Some fans booed as a stadium announcer instructed them to exit the building. Hours later, Greater Manchester Police announced that the suspect item was not a "viable device." "We have since found out that the item was a training device which had accidentally been left by a private company following a training exercise involving explosive search dogs," John O'Hare, assistant chief constable from Greater Manchester Police. Earlier in the day, police had maintained a strong presence outside Old Trafford as fire engines attended the scene. Sniffer dogs were also seen inside the stadium. About 3,000 Bournemouth fans are estimated to have made the trip to Old Trafford for the game. Bournemouth is a town on the south coast of England, and it is a round trip of about 500 miles (800 kilometers) to the northern city of Manchester. The match was one of 10 taking place on the final day of the Premier League season. The other nine matches went ahead. United was vying with Manchester City to finish in fourth place in the Premier League and qualify for the Champions League. City drew 1-1 at Swansea, effectively ending United's top-four chances. United has to beat Bournemouth by a 19-goal margin or more to climb above City. In rescheduling the match, the Premier League had to take into account the FA Cup final between United and Crystal Palace at Wembley Stadium in London on Saturday. Earlier, the Premier League apologized for the inconvenience that the postponement of the game caused to fans. "We are sure, in the circumstances, they will appreciate the need to do so," it said. Sunday's security scare rekindled memories of April 1997, when the dominant Provisional faction of the IRA used a telephoned bomb warning to force the evacuation of the Grand National horse race in Liverpool being attended by 60,000 fans, many of them Irish. That disrupted race eventually went ahead two days late in front of relatively few fans. United also enjoys a huge following in Ireland. The Provisional IRA has observed a cease-fire since July 1997 and renounced violence in 2005, but several rival factions continue to plot attacks in the British territory of Northern Ireland. On Wednesday, Home Secretary Theresa May told lawmakers in the House of Commons that the domestic intelligence agency MI5 had decided to raise its threat level of an IRA attack in Britain to "substantial," the third-highest level. That means MI5 - responsible for monitoring IRA splinter groups in Northern Ireland - considers an IRA attack in Britain a "strong possibility."